The polar bear was once the world’s most formidable predator. It now lies on the brink of extinction due to global warming and habitat loss. The bear and its habitat stand to gain some protections under the Endangered Species Act this year, and the U.S. Fish and Wildlife Service was due to make a decision about its "threatened" status by this Wednesday. The Service has, however, delayed the listing for up to one month! This leaves the bear and its habitat unprotected. Coincidentally, one of the largest oil and gas lease sales is set to occur on February 6, in the Chukchi Sea off of the northwest coast of Alaska – a region we will pay more and more attention to as our world warms and the sea opens up for potential large-scale exploration, I mean preservation… The Department of the Interior’s Minerals Management Service announced its plan to offer oil and gas exploration rights in February to 29.7 million acres in the remote Chukchi Sea off the northwest Alaskan coast. There are about 16,000 polar bears in the region. 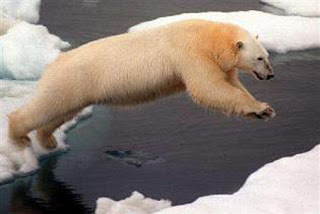 Such exploration would further stress the polar bear, and does nothing for our movement toward a clean energy future. Also: TheGreenMiles entry about this on DailyKos.